You know Eddie Van Halen made a Frankenstein guitar, well this is more literal than that. Also he forgot to do anything with the headstock at all, it looks the same shape and design as a regular Fender non-70s style Strat headstock – doh. We must remember Frankenstein was a regular looking fellow, so it’s perhaps wrong to call this the Frankenstein headstock as Mr Halen was equally wrong in naming his guitar. It’s proper long name should be Frankenstein’s Monster’s Headstock! 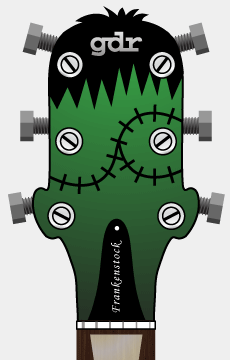 Yes, as you can see the shape of the headstock is roughly the shape of the average caricature of Frankenstein’s Monster’s head. Machine-heads have not tulip or dome shaped tuners but bolts. So when you tune this guitar you either have to have a very strong grip or a spanner/wrench handy. 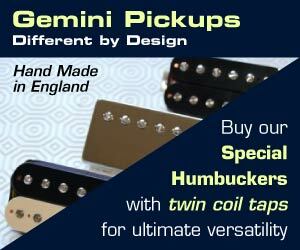 You can always hang one by some string to the guitar neck, then it will always be handy! If anyone ever did get round to making something based on this design I think it would be a nice touch to have real hair at the end there. That would make it truly monstrous IMHO. Also there are lots of finishing touches that can be done, it’s not a design that required utter precision and care in finishing a scratch or orange peel finish on the lacquer would make it again – more monstrous. If you are interested why I don’t attempt to make this design come alive myself it’s just because we are in the process of moving house and I have no workshop until we move in perhaps 3 or 4 months time from now. At the moment I can only dream up these ridiculous plans and do nothing about them. Coming up next I have a review or two; the Electro Harmonix Micro QTron is about to be reviewed and also a comparison of 3 distortion pedals I have, all very different from each other. Also I’m at the North West Guitar Show at Haydock Park near Liverpool tomorrow so might have something to talk about that show. Haha… the Frankenstock could deliver some horrible sounds! Great!